Mutiny Bikes have just released the latest version of the Dylan Lewis signature Death Grip Frame with a fresh coat of paint for 2017. The Death Grip frame is made from 100% Sanko 4130 chromoly tubing with a 74.5-degree head tube angle, 71-degree seat tube angle, 11.65″ bottom bracket height, 9.15″ standover height and a 13.7″ – 14.2″ chainstay length. The frame features a 125mm tall, heat-treated, offset thickness Integrated head tube, top and down tube gussets with the embossed Mutiny logo, a Mid bottom bracket, Integrated seat post clamp with the horizontal cut to give you better clamping with less torque, curved seat and chainstay bridges for 2.40″ tire clearance, removable brake mounts and 6mm thick dropouts with integrated chain tensioners. The 2017 Death Grip frame is available in 21″, 21.3″, 21.6″ and 21.8″ top tube lengths, weighs in at 5.2 lbs. (21.3″) colors of Translucent Black and Translucent Purple with a price tag of $329.99 through BMX shops and mail-orders that carry Mutiny Bikes worldwide. That’s a clean looking frame that’s built to blast! You already know what it’s capable after watching Dylan absolutely crush transitions and trails with it. 125mm tall, heat-treated, offset thickness Integrated head tube with gussets on the top and down tubes for a strong front end. Curved seat and chainstay bridges for 2.40″ tire clearance. The little Mutiny logo is a nice touch, too! 6mm thick dropouts with the integrated chain tensioners that everyone loves. 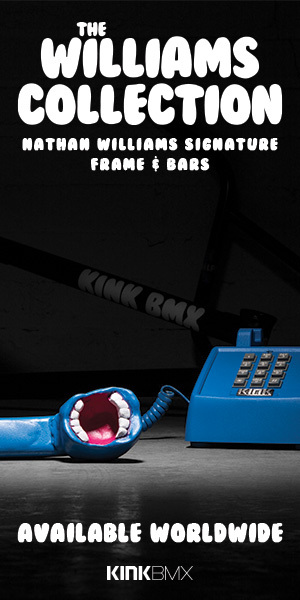 As we mentioned above, this frame is available now through BMX shops and mail-orders that carry Mutiny Bikes worldwide starting now. If you’re digging it, give your local shop a shout and let them know you’re looking to get your hands on one today! What do you think of the Death Grip frame? Do you have any questions? Let us know in the comments below!